Kelly Lester’s business is hugely successful (she’s on track to make $1.5 million in 2013) and it came straight from the kitchen. She’s built her brand by working closely with bento bloggers and other diehard fans of her product. And, at the center of her business strategy is a surprising secret — Pinterest. Kelly needed a solution to one her most pressing problems — she was looking for a quick, easy ways to create healthy, interesting lunches for her three kids. So she developed EasyLunchboxes, a slick, easily washable lunchbox set. She also managed to introduce her product into a very (ahem) hungry market. She started EasyLunchboxes right smack in the middle of the “bento” craze in America. “Bento,” common in Japan, is a single-portion packed meal, usually homemade, that is arranged in a single box. The bento craze has now immigrated to America, inspiring hundreds of blog posts, Facebook updates, Pinterest pins and Instagram photos. For the last few years, bento-style lunches have become hugely popular with American parents who had the same problem Kelly had — they were looking for a fast, convenient, fun way to make school lunches that went beyond a traditional PB&J and potato chips. We asked Kelly to talk to us how she uses content marketing to grow her business and expand her market. In this unique and inspiring case study, she gives us her best tips and suggestions. What is the name of your business, and what do you do? My business is called EasyLunchboxes. My EasyLunchbox System takes the madness out of lunch packing. EasyLunchboxes compartmentalized containers and cooler bags allow you to pack lunches fast — without wasting time, money, paper, or plastic. My container sets are the #1 best-selling lunchboxes on Amazon.com. My customers are people who packs meals. Anyone, of any age, who eats food. I would like to say that I came up with my business idea because I was fascinated with “bento,” the Japanese style of food packing, so I decided to design an ideal version for American boxed lunches. But really, I came up with the idea because I was lazy. I didn’t want to spend time in the kitchen packing lunches. But, a parent has to feed her kids (I have three children). School-provided lunches (ick) were not an option. If I had to pack, I needed to figure out a way to do it fast. I also wanted to pack waste-free. I write my own blog, I maintain a YouTube channel, and I am active on a number of social media platforms to reach my customers and engage with potential buyers. Most of my success (and my traffic) comes from the things I share on Facebook and Pinterest. I am in the very unique position of having a product that vividly lends itself to sharing, via images. Many of my customers are moms of school age kids. This is also an incredibly active demographic group on Facebook and Pinterest. This market loves pictures of food, recipes, tips on how to pack lunches, ideas about how to make life easier, how to run a home more efficiently, ways to have fun with kids, etc.. One (or more) of these topics are covered in practically every image I share of a meal packed in my EasyLunchboxes containers. I use my blog to post content and answer all of my biggest customer service questions and general FAQs, and I’ve created great pinnable images for those posts, too (so I entice people on Pinterest to click through and find out the answers to the questions). This is where I think I’ve done something pretty unique. With absolutely no money for advertising, I realized I needed to generate word of mouth. So I sent lots of samples to bloggers for reviews and giveaways. Pretty soon, they were contacting me and, as of today, there are not only hundreds of reviews that link back to my site, but on a daily basis, there are dozens of new photographs posted of lunches packed in my EasyLunchboxes. Many of these pictures are posted on “bento blogs” — blogs that are all about packing lunches, but quite a number of them are posted on Instagram and tagged with #easylunchboxes. I am personally not active on Instagram. I don’t take daily pictures of the lunches I pack for my kids. But have generated tons of #easylunchboxes photos simply by sharing a post about how to share Instagram photos of your lunches. I would say that a huge number of my orders are a direct result of people finding my containers on Pinterest. Many of the Pinterest pins lead back to blog posts that have a link to my site or my Amazon store, where people can learn more and buy my products. The other thing I do is “re-package” images of packed lunches that people post on their blogs. If they post a few pictures of different lunches, I’ll take them and make a graphically interesting collage of their images, add their logo (if not already there) and add an eye-catching title to put it all together. I’ll post everywhere and link this “enhanced” image back to their site, bringing them lots of additional traffic. They love it! When people post images of meals packed in my ELB containers, I personally thank them by leaving a comment on their blog, re-pinning it, tweeting it, sharing it on Facebook or Google+, pretty much everywhere I can. Yes, it’s a lot to keep up with, but when someone hears from me or sees that that I’ve commented on their post or shared their image, they really appreciate the virtual pat on their back — and they tend to want to post my photos of my products again. I have built enormous brand loyalty and passion for my products just by saying thank you in this way. I think I’ve found everything I’ve ever needed to know by first searching on Google. The other really helpful resource are the private Facebook groups that I have been invited to join. Groups of like-minded business people who feel free to ask questions, share war stories, and give support and valuable information whenever asked. The folks are virtual, valuable friends. EasyLunchboxes is technically my “other job.” My life’s career is as an actress and singer. “Reinvention” is just part of the job as an actress; every time you work, you create a new role. This skill helped when I took on the role of “stay-at-home mom,” but then I quickly realized that I needed to do something with my artistic side, too. Back in 1994, I realized that most light-switch covers were either plain white or beige. I started decorating and selling creative light-switch covers, eventually renting booth space at an art show to see if I could become a entrepreneur. After a year of steady effort, I started selling wholesale, and my switch plates wound up in hundreds of museum stores. I had my own little factory set up close by, but ran the business, (now called Art Plates) from my home, where I was able to keep an eye on the kids. In 2006, I sold Art Plates and returned briefly to the theatre world. But reinvention called out again, largely because of the economy, and I now find myself running my own business once more. Motherhood was the inspiration for my current business. And with no advertising budget, just an obsession with online marketing and a bit of creativity, I’ve grown EasyLunchboxes to its current success level. What were some of the main tipping points or “a-ha!” moments? I’ve had way too much fun and success serving my customers directly. Having my products for sale via my website and Amazon only was not something I had planned on, it just has leaned that way all along. I never put any effort into creating relationships with wholesale vendors. Recently, I made the choice to stop wholesaling to stores and distributors altogether (this had not been a large part of my business anyway) so that I could concentrate all of my time and resources on the customer, not the middle-man. I’m a firm believer that everything works out for a reason. I’ve made a few mistakes, and thankfully, only “wasted” a small amount of money. But if I went back and changed anything, would I be where I am today? Better leave well-enough alone, as my grandmother used to say. Why do you think you became an independent business owner or blogger, when most people just stick with the career they have, even if it’s unsatisfying? What’s different about you? I have seen my business grow by about 50% each year since launching in late 2009. By the end of 2013, I expect my sales to be about $1.5 million. Because of my performing background, I’ve put myself front and center as the face of my own brand. I have been featured by different companies as the face of small business success (Amazon, Wells Fargo) and I have been hired by food brands, as the CEO of EasyLunchboxes, to promote their products on TV. I look forward to doing more of that. My goal is to continue to reach more and more people — offering them the tools and ideas to make healthy grab-and-go meals fast, easy, and fun (with little negative impact on the planet). My strong sales are a direct reflection of the work I do to achieve one of my top goals — to engage and inspire anyone who wants to pack a nutritious meal for school, work, or travel. Obesity and health issues due to poor diet can be largely eradicated if people have the knowledge and the tools with which to change their eating habits. As a community, together, we are making a bigger difference. Share other people’s content generously, and share your knowledge and skills generously. What goes around comes around. People love to give back to (and do business with!) people who are nice, friendly, helpful, and generous. Kelly’s story is very interesting. I’m pleased that her venture turned out so well for her. Oh the article was about Pinterest, Sorry the food part distracted. No problem, Geoffrey – the article was about Kelly’s business savvy, not just Pinterest…I got distracted by the food part, too! So many markets for her products!! Hey, very inspiring story, Kelly! Imagine how many people could change their situation if they just had a little work ethic. Great story about taking an idea and turning it into a business. I’m getting more involved in Pinterest and have to say that I’m digging the social network. I resisted Pinterest for a few months, okay, a year. But I’m getting used to it. I have more to learn, but I’m gaining followers and having a great time pinning. P.S. Could you make the Art Plates link open in a new window? Clicking the “Back” button is easy, but it’s easier to have a link open in a new window. 🙂 Thanks! This is the type of article I love seeing here on Copyblogger. What an awesome tale of success, Beth. I did a post on how stay at home moms can use blogging to make a bit of extra money that did really well a few years ago (http://www.blogtyrant.com/stay-home-moms-make-good-money-blogs-online-business/) and I think I might edit that post to include a link to this case study. Great article, Ramsey – I love that more and more moms are starting online businesses (I work with a lot of them, too!) That’s one of the reasons I wanted to spotlight Kelly’s story. I think it’s fantastic that she built this business while staying at home with her kiddos (and that the original idea came from a problem she had as a parent!) Thanks for featuring the great mom entrepreneur stories. An inspiring story certainly. In reading it I couldn’t help but be reminded of the 24 Genius Characteristics authored by Dr. Alfred Barrious in his book, “Towards Greater Freedom and Happiness”. Kelly’s story is so inspiring… thank you for the feature! I’ve learned a few interesting things about content marketing that I’m going to adjust for my niche site empire… never used Pinterest before, and I think it’s a channel worth benefiting from, regardless the niche. I look forward to reading more stuff like this on CopyBlogger, definitely! I love the idea of your product – and as I consistent blogger (I have several blogs), I am in awe of your success – Congrats! I wondered if you were going to make a glass version of your lunch containers? I am not a huge fan of plastic is why I ask. No – I don’t have plans to do a glass version. I’ve found a niche/price point that is working for me so, at this time, I prefer to stay laser focused on that. Hi Joshua – with so many social networking tools out there, I know it’s hard to figure out where you should be spending your time and energy. But I think Pinterest is an interesting possibility for some businesses (not all) because it can be an amazing traffic source. Pinterest is driving a HUGE amount of traffic to websites and blogs right now, and I think it’s worth exploring. Great story. Love how you are using Pinterest as a jumping off point for answering customer questions on your blog/FAQs. Inspiring story! Thanks for this article. So inspiring! I think I’ll be ordering a few of these for my kiddos! Great inspiring tips and really enjoyed the read. This gives the momentum to think more about how best we can offer a value to the readers and give solution for the people at large. Great exmaple and thanks for the sharing. Thanks Beth (and Kelly) for the interview. I really like seeing these types of stories/interviews on copyblogger because they are “real world” experiences rather than the theoretical (which does have its place). I find that I can draw practical application for my own business when learning what has and has not worked for someone. Yep, Chad! 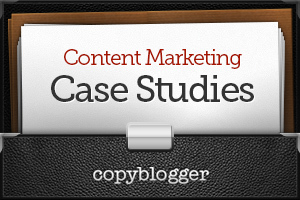 That’s exactly why we started this case study series — to spotlight inspiring stories of real companies using content marketing. I love that we’ve been able to feature so many different kinds of companies. Kelly’s content (both on Pinterest, and on her blog, etc.) is great, and she produces a lot of it — so it doesn’t surprise me that your wife has come across it as some point! Wow! A zipped box with Tupperware! That’s it…and she made a business out of it! Love the story. Its all about adding value and solving a problem. Combine that with a good work-ethic and you’re golden. Very interesting story. What I wonder is how she was able to actually get started with creating the physical product. When you have an idea for a product, how do you get it manufactured? And wouldn’t that require a lot of startup money — to pay for first batch of products? Very inspirational! Now I’m wishing I had some sort of physical product! Well done, I’ll definitely be spreading this story about. Awesome product Kelly! Congrats on your success. Hope you were able to patent your design in some way. Wish I had those when my girls were little, I packed lunches everyday in multiple containers. I’m sure the kids love the presentation and ease of use as well. I know my girls would have. You are an inspiration to all working moms! I love how it was mentioned that she self-taught herself. I think that is inspiring to people who would like to start their own business to even making their own blog. Great article! Kelly Lester is an amazing woman and a generous person, plus she’s a hoot! It’s a rare combo and we adore her for it. Go Kelly!! Thanks for sharing such an inspiring story. Through her success, Kelly has proved that what goes around will definitely comea around. Kelly’s generous helping nature has bring her success as good people always love to return favor to those who helped them and this is what worked for Kelly. Moreover her social media stragy is worth mentioning. There are lessons hidden in her success story, the lesson of generousity, the lesson of effective marketing. I am quite sure that everyone will get benefitted from her story to achieve success in their respective niche. Very inspiring interview. I’m agree with her. What we give, we get back. I just love this interview! Very inspiring. I’ve ben trying to devise a solid Pinterest marketing program for several of my clients (we do web design and marketing). Do you have any tips for good books / courses I can check out to point me in the right direction? Very inspiring story! When I took a look at your lunch containers they reminded me of the Ziploc containers, almost identical! It’s amazing that you’re able to successfully compete with Ziploc. Inspiring story. Pinterest is becoming a great traffic driving machine when used properly. I love the thought provocative questions within the post. Excellent job. 1.5 Million! That too with pinterest route… Really an inspirational read. Perhaps, someday! I love this line…I use my blog to post content and answer all of my biggest customer service questions and general FAQs. If you customers are asking questions why not put the answers out there for everyone. Chances are others have the same questions. Nice article and very inspirational. Thanks. It’s so inspiring to hear about Kelly’s success. I’m a stay at home mom too so this is just getting me so motivated! Good luck Kelly! Pretty cool article and story.